Hanga News gives you in brief news about Hanga Abbey in Southern Tanzania: what the monks do, projects, visitors, and social services. Early November 2012 the superiors and represenatatives of the Benedictin Union of Tanzania met at Hanga Abbey for their regular annual meeting. This Union was established to foster fraternity among Benedictine communities of Tanzania. During the meeting members have the opportunity to share their experiences in their reliogious lives as well as their struggles, successes, economic endeavors and spiritual lives. Currently the president of the Union is Abbot Dionis, OSB of Ndanda Abbey in Mtwara. The communities represented in the meeting were Ndanda Abbey (Abbot Dionis), Peremiho Abbey (Prior Fidelis, OSB, and Fr. 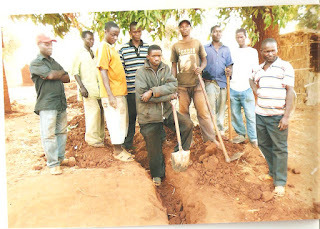 Steven Komba, OSB), Hanga Abbey (Abbot Thadei Mhagama, OSB, Frater Theodory, OSB, and Frater Anno, OSB), Mvimwa Abbey (Fr. Kayombo, OSB); Chipole convent (Sr.Mfurahishi, OSB), Mafinga Camaldolese (Sr. Pascalina, OSB); Ndolo Convent (Sr. Joachim Mnunduma, OSB); Benedictine Missionaries of Tutzing (Sr. Roseann, OSB, Sr. Hildegard, OSB) as well as Imiliwaha convent (Njombe). The monks of Hanga Abbey were happy to host the guests and welcome them back to enjoy the new St. Pirmin guest house facilities. The photos below show those who attended the meeting and sections of them in the meeting sessions. In the month of November this year 2012, the abbey had the privilege of having visitors from Austria. It was a group of eight women wanting to see Tanzania particularly southern Tanzania. The group was led by Barbara for Petra Gehrer who has business for tourists to come to Tanzania especially in the south. The group was able to visit local families at Hanga village, visit lake Nyasa, explore Udzugwa mountain ranges, animal parks, etc. We welcome visitors to the abbey, and we would be happy to host any visitors and give them tour to interesting sites in the country. Toward the end of October this year 2012 Hanga Trade School said goobye to 14 graduates who had fininished their four years of training in various trade workmanships. These include masonry, carpentry, automechanics, electrical istallation, plumbing and tailoring. Of the 16 students two were women. We hope more girls to be joining the school as years go by. Particularly interesting, was the fact that each graduate was given a present of tools of their the particular trades they learned; that way these young people are equiped to be in employment right away by self employment or being employed. It was amazing. Congratulations to the school administration for all they did and do for these young people. The guest of honor for the graduation was Br. Vianey Fuli, OSB, from Peramiho Benedictine Abbey. He was presented by an office chair with inlay decoration work of the cartentry graduates. In the photo is the graduating class of 2012 wihth Frater Patrick Mwinuka, OSB, in white cassock. Right: some graduates with their friends and relatives. Br. Vianey Fuli, OSB, is giving his address as a guest of honor. With the help of benefactors from the US a village in rural Songea district in Southern Tanzania, Mhepai, will be having clean water in a few months to come. Mhepai village like many other rural villages in Tanzania have the problem of getting clean water all the time but soon they will say goodbye to the problem. Since October this year, 2012, probably until early December the villagers will be busy with the project. Already pipes have been bought and the villagers have dug a 3 mile (5km) long trench. A site on the higher ground will have a small dam built to catch water to the lower ground of the village. The villagers have made baked bricks, and collected sand and rock ready to build the small dam. 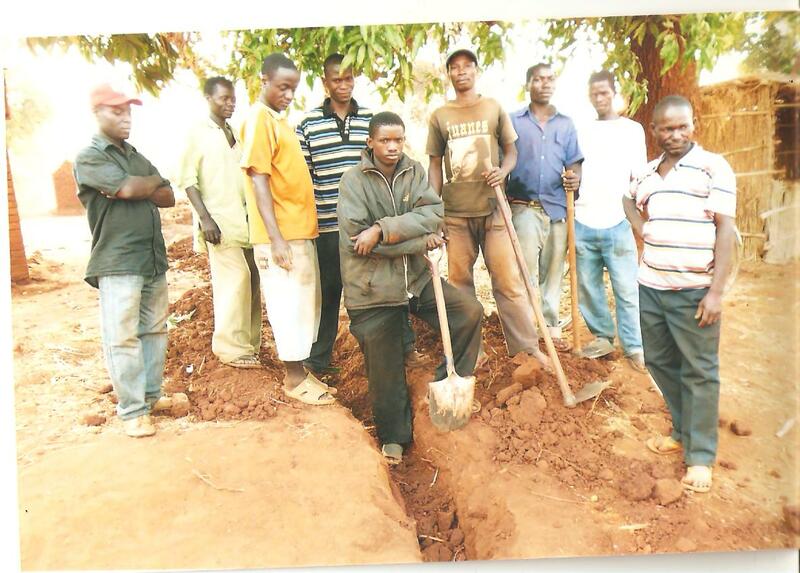 When the dam is completed pipes will be laid in the dug trench ready to supply life - clean water- to the villagers!! It is a blog designed to give news of Hanga Abbey in southern Tanzania and the projects that the abbey is supervising.